The guidebooks will tell you to go to Zamość because it is a perfect example of the Renaissance “Ideal City”. They might talk about its successful history as a fortress. And, there will no doubt be mentions of archetectural accomplishment. All very warranted praise. But, I don’t think that really gets at the heart of what makes it worth the trek to this obscure corner of Southeastern Poland. Zamość is not a story about crenilans and street planning grids. It is a story about one man and what he made. Zamość exists because, 450 years ago, a young Polish nobleman left his home to be a paige in the courts of Paris. Studies in Germany and Italy eventually led him back to Poland, where he rose through the ranks of statesmen to become second only to the King in political power. And then he decided to build a town. From scratch. Nestled near his own hometown, he set about creating a work of art. It was an audacious task, but Jan Zamoyski had the education, influence and finances to pull it off. Yes, based on all those Renaissance ideals he’d picked up along the way. Yes, to architectural success. Yes, as a fortress and important trading post. But, you don’t have to be able to tease out the difference between an ionic column and a baroque balustrade to be able to appreciate Zamość. You just have to be open to its story, and the way it has unfolded. I took my four youngest out to the countryside near Zamość for our Quiet Week this year. So, we had plenty of time to explore. We wandered into Zamość three of our days there, and could happily have spent more days roaming its streets. We spent our time wandering, not too concerned with what was nearby anything else, and with no guiding plan to our days. I’ve re-grouped our activities by geography (now that I know the layout of Zamość) and put them into a two-day itinerary, which is a comfortable pace. You could certainly see everything listed here in one day, if that’s all you had. But, two days would allow you the time for unhurried exploring. Or, if you have the time, as we did, you can take it even slower. The Zamość main square owes all its charm to artful city planning. But, walking into the square, the Renaissance proportions slip into the background (at least, to the untrained eye that I brought to the Square). The reality of walking around in it is simple, uncomplicated European charm. The Armenian tenement houses stand, juxtaposed against the almost unbroken uniformity of the other tenements. Presiding over the open square is the town hall, with its spiresoaring overheard and stairs substantial enough for a proper Cinderella getaway scene. Housed in one of the Armenian Merchant Tenaments, this museum meanders its way through Zamość history. It has a bit of this and that: from Zamoyscki family history, religious sculptures, Armenian merchant lifestyle, to archeological finds from the Bronze Age. It is surprisingly diverse inside. Though almost all of the Polish signs were lost on me, I still enjoyed the walk through the history of this area. The Synagogue is, of course, nothing to what it once was. Only one section of the once large complex was rebuilt. Culturally, as well, its place in the community has dwindled as the Jewish community has never fully revived here after World War II. But, even in its diminished state, I found this a fascinating place. I was scribbling notes furiously, as I learned all sorts of intriguing things about Jews in the area and Judaism in general. It still surprises my American sense of time scale to watch my children run up and down the slopes of a Renaissance moat. I can take them to all the museums I want. I can point out to them the oak leaves carved into the New Lublin Gate, and explain that they symbolize courage. But, the truth of the matter is that, their favorite part of each of the gates is knowing that nearby there would be old embankments where they could test their climbing, and see how far out they could jump in descent. That feeling and touching and experiencing for yourself can’t be replaced by any lecture or display. The walls of Zamość still demarcate a great deal of the original city. Much of our time in Zamość was these walls were in our periphery. So, when I discovered that we could take a tour inside them, I couldn't wait to see them from the inside. Starting at Bastion Number Seven, the tour lets you take a look from the top of the walls, and then inside a long stretch of the old walls. Even though the explanation was completely lost on us (it's only in Polish), it was still a exciting to physically experience a tiny bit of what it would have been like to inhabit this anthill of a fortification. We ducked through doorways, peeked out gun placements and walking the long, arched corridors that make up the innards of the wall. I acknowledge that a contrived Medieval archery range nestled beside reconstructed cannons is just a cheesy amalgam of historical anachronisms. But, it also happens to be a perfect antidote to too many museums and church visits for the younger set. I let them choose between shooting the cannon one time or a round of archery each. They were thrilled to try their hand at the bow. I enjoyed this stop far more than I had expected. I ducked in, simply because it was inside the walls of the city, just where we were walking in. But, I found it to be a unique experience. It’s a fun collection of historical costumes that tell the story of Poland through its evolving fashion. My favorite part of my visit was chatting with Dominika, who, along with family and friends, created the collection. She explained, not only the different clothing styles, but also about how they reflected the political realities of each age. From our parking spot, this is where we entered the city each day. In Zamość's early days, it would have served as the gate toward Krakow. Built in the years just after the capital moved to Warsaw, the road to Krakow would still have been vital. Today, it’s been beautifully restored, and still has lots of embankments left to run up and down (which, you know, is critical to certain members of our party). On this side of the city, there's also a nice little walking/biking path where you can meander along the old city walls, and up over soaring railroad bridges. Yes, Zamość is an embodiment of the Renaissance ideal of humanism. But, it is also took its role as a defensive city very seriously. Along with the focus on education and beauty, it is also a city about battles and armor. It’s worth succumbing to a bit of this, even if you’re not a natural war nerd. The Arsenal Museum actually consists of 3 separate parts: a display of armaments from Zamość’s founding, a movie that explains the city’s military history, and a museum with more modern military paraphernalia. While none of that is typically what I seek out, in this place, where we’re walking amongst the battlements, I found this surprisingly intriguing. I had not anticipated how much I would enjoy ducking into churches. I'm intrigued by the ways different congregations create a container for their worship. Though the Zamość cathedral looked similar to others we'd been in, I enjoyed exploring it. What made it unique were the stories my daughter (who'd been to Zamość with school) was whispering to me as we walked through the nave. She told me about an artisan, a father, and a prisoner, and the mark they each left on the Cathedral. I am always a fan of a bell tower, a clock tower . . . even a water tower will do. I just love any vantage point that lets me take in a city from above. 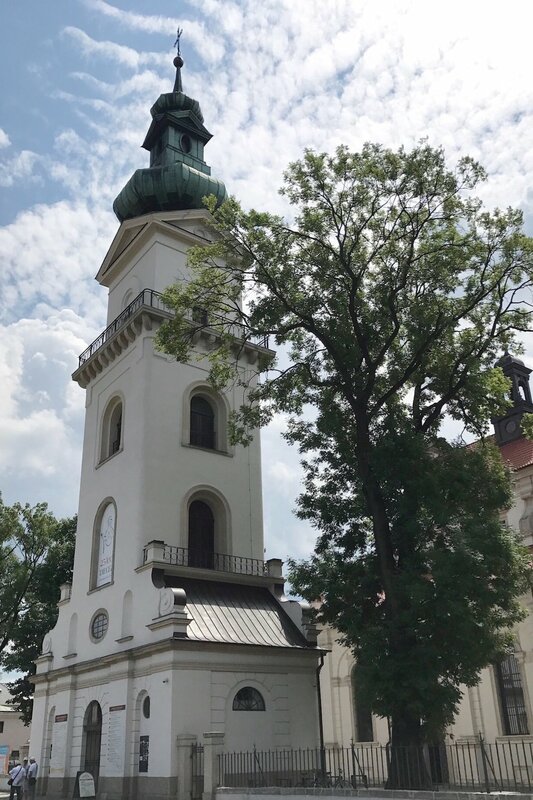 The bell tower for the Zamość cathedral is particularly good for this, because it allows you to see firsthand, the big picture of the Zamość city plan. You can’t go anywhere in this town without running into the original drawings for the design of the city. So, it’s good to see how it all plays out in reality today. At the top of the tower, there’s a set of diagrams that dissect that old map and show you what you’re seeing from each angle. Maybe it’s because a 16th century city gate stands as forgotten sentinel at the edge of the park. Maybe it’s because there just aren’t that many people to share the paths and promenades with. Maybe its the soaring fountain or the bridges over the pond. Or, maybe it’s simply that we visited on a beautiful, clear day when the tempatures were hovering just at “gorgeous”. I’m not sure what exactly drew me to this place. But, as I strolled its paths I kept thinking that it may well be the prettiest little city park I’ve ever walked through. This city throws around city gates like they’re parking meters. I felt like I was tripping over another Renaissance era gate every time I turned around. This one, the Old Lublin Gate has a pretty interesting story. It actually spent most of its life walled up. No one agrees anymore why it was walled up almost as soon as it was made. It might have been for defensive reasons, or it might have been a dramatic “in your face” gesture by the inimitable Jan Zamosky to a defeated enemy. Whatever its story, it now sits in a picturesque little park, housing a restaurant inside. Zamość, like all of Poland, was scarred by World War II. The Rotunda, once a defensive watch position, was turned into grim amphitheater of death. Nazis gathered the community’s brightest minds and systematically massacred them all within these walls. Today, it stands as a quiet memorial to the thousands who lost their lives within its confines, and the millions of other victims of the war. It’s a somber and compelling visit. Even though our stay was slow and generous, there were a few things we didn’t get to try, but would have liked to. The city has a very inexpensive bike rental program (about 1 Euro an hour) that we were really hoping to take advantage of. Unfortunately, they don’t rent any child’s sized bikes, so it wouldn’t work for us. They do have a couple of bikes with child seats on the bike, so if you’re going with little ones, that may be an option. There are great paths that run around the outside of the walls and along a little canal, just outside of Old Town. Getting a feel for the city by bike looked ideal. We had intended to make a visit to the Zoo, but the day we were planning for it turned out surprisingly hot and humid, so everyone lost their vim for the outing before we made it over there. It is quite close to the Old Town, though. And, though I think it’s quite small, does look like it’s worth the visit. I didn’t discover these free audio guides until after we’d returned home. But, had I known about them, we would have given them a try. The parts I’ve listened to here at home aren’t the most engaging I’ve ever experienced, but they do have some good information. Referring to this as the “new” anything is a bit of a misnomer. It was built in 1820 after the Old Lwow Gate had been walled up. This was the only one of Gates that we didn’t happen upon during our visit. I later discovered that it’s used now to house a Symphonic Orchestra. I would have liked to pop in to see if there was a concert we could attend. There were several free parking lots throughout the city, and each seemed to have available spots throughout the day. I loved the lot at the end of Szczebrzeska street. It was convenient for heading into Old Town, and was nearly empty each day. If it ever were to fill up, there’s another free city lot nearby as well. As an American coming to Europe, I always think easy, free parking should be celebrated. The great thing about a Renaissance city is that it’s set up in human proportions. It’s made to walk from one end to the other easily, and that is exactly what we did. I loved that I could park the car and leave it for the day, easily covering all the ground we needed on foot. Compared with the hoards in Rome or London, even Warsaw and Krakow are uncrowded destinations. But, Zamość takes this to a new level. Even visiting in the middle of Summer, and sometimes on the weekend, we were sharing each museum with a handful of people at most. Many, we had to ourselves. The streets and squares were open and we never had a sense of tripping over people. Renaissance embankments turned running hills are the travel equivalent of Bob Ross’s happy accidents. We ended up spending more time on these slopes than any other single location in Zamość. It was one of those things that you’d never think to put on a travel itinerary, and yet, it was the ideal thing for a tiny hoard, just stretching their legs again after another school year.